please RSVP to patrick@finalstraw.org to reserve your space. A diverse panel discussion featuring Dr. Emily Brady (Edinburgh University), Mike Small (The Fife Diet), and Ben Twist (Creative Carbon Scotland), three of Scotland’s leading doers and thinkers in three specific areas of environment and sustainability. Panellists will respond to the notion of a holistic view of nature and humanity, one which asks for a closer relationship between people and environment. Can such an idea fit within our current socio-economic system? In the end, how can individuals and institutions be compelled to alter their habits to live and act sustainably? Professor of Environment and Philosophy at the University of Edinburgh, and author of The Sublime in Modern Philosophy: Aesthetics, Ethics and Nature (Cambridge University Press). The cultivation of humanity’s connection with the natural world offers a key to repairing our very deepest issues, both socially, and ecologically. 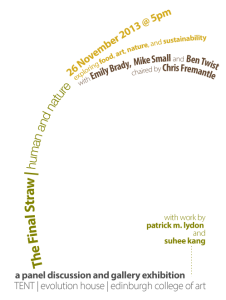 Final Straw is an active documentary project, where explorations, interactions, and public interventions – such as the panel discussion – go hand in hand with the act of creating the film. To date, the project has explored natural farms and created related events in Japan, Korea, the United States, and plans to continue this work in the United Kingdom as they ready for the film’s premiere in Spring of 2014.